Holland America Line: Lucky No. 14? Dating back 135 years to 1873, Holland America Line has seen change in its time. Moving its headquarters temporarily from Rotterdam to Curacao during the Second World War, New York became the company's headquarters in 1971, and finally, in 1983, it moved to Seattle after its acquisition of Westours. 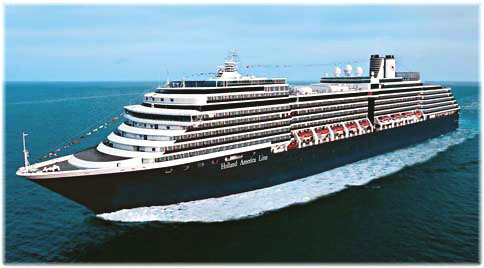 In 1989, Holland America Line, with a fleet of four ships, became the first important brand to join the Carnival stable. Now, this week's christening of the new 86,273-ton Eurodam by Queen Beatrix in Rotterdam (the tenth Holland America ship to be christened by a Dutch royal), sees the company up to fourteen passenger ships, more than it has ever had in its history. 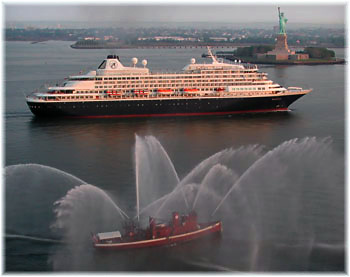 The 936-foot Eurodam, Holland America's latest "Signature" class ship, has 2104 berths and a tonnage greater than the Queen Mary, Queen Elizabeth, Normandie, France or QE2. But with 81 ships now of greater length, the Eurodam actually confirms Holland America's position as the operator of "mid-sized" ships that it claims to be. All Holland America ships can transit the Panama Canal. Meanwhile, everyone is guessing whether the follow on order for another Eurodam will be named Roubledam, Kronerdam or Dollardam. Truth is, Holland America had still not re-used names like Didam and Dubbeldam, Edam and Leerdam, Obdam, Schiedam, Spaarndam and Werkendam and even the German Potsdam that it had once used before, so it didn't really need to invent a new name yet. Built on the same platform as the Noordam quartet (2002-06), she is similar to two other Carnival group ships also built to this plan (just change the funnel and decoration according to brand) - P&O's 82,972-ton Arcadia (1918 berths, 2005) and Cunard's slightly longer near-sister the 90,049-ton Queen Victoria (2000 berths, 2007) - but with Holland America decor. There is no question that the twenty years since the Carnival acquisition have seen a huge turnaround for Holland America, which has grown out of all proportion compared to some other lines. Starting with four 1258-berth Statendam "S" class ships (1993-96), ordered not long after the takeover, these were followed by four 1216/1432-berth Rotterdam "R" class ships (1997-2000) and four 1848/1918-berth Noordams (2002-06), plus the transfer of 794-berth Prinsendam from Seabourn in 2002. As related on May 19, Holland America's involvement in Alaska dates back to 1947 through its acquisition of Westours. Holland America have built this trade to the point where the summer of 2009 will see fully eight Holland America ships in the Alaska trade, five round trip from Vancouver and three round trip from Seattle, the line's headquarters. Three of the Vancouver ships will also perform one-way cruises between Vancouver and Seward on certain dates. In addition to its Alaska cruises, Holland America operates Holland America Tours, the former Westours, together with Westmark Hotels, operating six hotels in Alaska and three in the Yukon, and Gray Line of Seattle and Gray Line of Alaska. With the delivery of the Eurodam, Holland America will now have six ships in Europe, only one less than Royal Caribbean, who will have seven there in 2009. Except for the Finnish-built Prinsendam, the line's "elegant explorer," all its ships were built in Italy and they are all today registered in the Netherlands. These attributes make them interesting for Europeans as well as Americans, although the attraction of sailing on a dollar-priced ship is not lost on Americans when they look at the cost of the euro today in relation to their own dollar. Although the line closed its North Atlantic service in 1971, it has continued to send ships to Europe and with more ships now in Europe, the Seattle-based line is doing all it can to draw on its European roots and entice more European customers. It even enlarged its office in Rotterdam although this is mainly to look after the recruitment of Dutch officers. An interesting aside here is that next year will see Holland America's last Transatlantic liner, the former Rotterdam, become a floating hotel near the Hotel New York, Holland America's one-time head office building on the Wilhelminakade in Rotterdam. In north-eastern North America, where Holland America Line has long had an audience, it has announced three new ports for 2009. The longer Canada and New England cruises of the Eurodam and Maasdam will now variously call at Gaspé, Baie Comeau and Sept-Iles, giving passengers new scenic, cultural and wildlife opportunities in the Gulf of St Lawrence. The Eurodam and Maasdam will offer twenty-one Canada and New England cruises, ranging from seven to fifteen days, with cruises now offered from five embarkation ports - New York, Boston, Montreal, Quebec City and Fort Lauderdale. Holland America was the first cruise line other than Orient Lines to send a larger ship to Antarctica. During its 2000 World Cruise, the Rotterdam visited the Antarctic Peninsula in January with 936 passengers. Initially, the line had intended to put passengers ashore at the Argentine station at Esperanza, but this idea was abandoned. This year, the Rotterdam undertook two 20-day South America & Antarctic cruises and in 2009 these will be taken by the Amsterdam. These 20-day cruises between Rio de Janeiro and Valparaiso spend two or three days visiting Deception Island, Paradise Bay and Elephant Island in Antarctic waters. A larger ship, the Oosterdam will then take over these duties at the end of 2009. The Prinsendam also did a "Grand South America & Antarctic" cruise this year, visiting the same areas, but to quote one of her passengers, "our only regret is that we couldn't go ashore... We'd love to go back on one of the myriad of smaller ships that are allowed to take people ashore." Ships carrying more than 500 passengers are not allowed to land passengers. In any case, the zodiacs used to effect these landings carry no more than 15 passengers each so it would take too long to land so many passengers, especially as no more than 100 are allowed ashore at one time. The larger ships are limited to making sure their tennis and volleyball courts are roped off, deck chairs and blankets tied down and no napkins slip overboard, reminding passengers at the same time not to feed passing wildlife or throw anything overboard. In 1988, Holland America purchased Wind star Cruises' fleet of sail-assisted ships, but last year it sold this three-ship brand to Ambassadors International Inc. This was part of a Carnival move to sell off niche brands that also included Swan Hellenic in order to concentrate on its core brands. The number of berths on the three Windstar ships together was less than any one of Holland America's own ships. Other than Holland America Tours' private "McKinley Explorer" trains with dome cars and its luxury coaches in Alaska, Westmark Hotels and the Gray Line operations, Holland America's only other outside interest today is Worldwide Shore Services, a logistical and support company. First impressions count. On boarding the Eurodam at Southampton last week, it was too bad that Holland America has chosen a cheap-looking golf shirt as a replacement for the traditional steward's jacket that its staff used to wear. While the service is just as good, the attire is a touch informal for these ships, which are meant to be at the top of the premium market. Some "lesser" lines have better uniforms. The Eurodam is a development of the Noordam and has an extra alternative restaurant in the Tamarind, located on a new deck around the funnel, roughly where The Orchid is in the Arcadia and the Grill restaurants in Queen Victoria. The Eurodam also features an Italian alternative, the Canaletto, which by day is part of the lido restaurant, itself a feature that Holland America was first to introduce, in the 1970s. Another new feature is the Explorations Cafe, located atop the ship and forward next to the Crow's Nest bar. As well there are several private cabanas, which have been added to the aft end of the spa, called the Retreat, located forward of the pool area. The basic ship design has been used half a dozen times now. An enlarged three-deck show lounge empties out after show into the casino, and from their into the disco, called the Northern Lights, as Holland America sets out to attract a younger crows. Aft, the former slightly tiered of decks of the Noordam have given way to a more boxy stern, thus adding room for another 150 or so guests. For a supposed upmarket line, some of the UK agents who visited in Southampton were surprised that Holland America was using paper cups in its Explorations Lounge, which is jointly sponsored by the "New York Times." But British agents obviously do not understand American tastes. There is a lot of good Dutch-designed art and furniture on board but carpets in the corridors and some of the stairways look a bit downmarket for the level that Holland America is trying to achieve. And the historic black and white photographs used to decorate cabin corridors are extremely grainy, probably a result of trying to blow up snapshots into larger sizes. Prize of place goes to Stephen Card's ship portraits, a Holland America tradition, in the forward stairwell, and its usual collection of Dutch antiques. The ship's lounges are spacious and there is a very good selection of tastefully-decorated public areas but in some parts of the ship speakers play music all day long, which while it may be to the liking of some is not to the liking of all. Holland America now serves all seven continents, as it likes to say, offering cruises from 35 base ports, only eleven of which are in North America, ranging from two to 117 days in length. Four distinctive Grand Voyages are offered aboard Amsterdam, Rotterdam and Prinsendam, the line's long-distance ships. These range from a 50-day Mediterranean and Black Sea voyage to a 117-day circumnavigation of the world. And the line continues its presence in the Caribbean by winter as well as returning to its one-time base of New York with year-round sailings by the Noordam this year. The Eurodam, meanwhile, with her extra dining venues, gives Holland America more choice, and her lighter décor compared to the older ships, but still with an important Dutch influence, continues the line's "evolution of excellence."